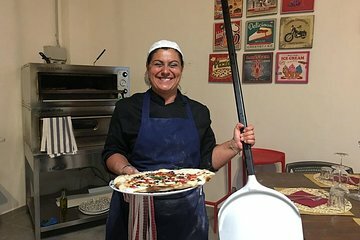 Descubra as delícias da pizza italiana recém-assada e o delicioso gelato com uma aula de culinária de 3 horas em Florença. Aprenda dicas e técnicas para fazer a pizza perfeita, o saboroso molho de tomate caseiro e o sorvete de frutas frescas. Finalmente, sente-se para entrar em suas criações com seus colegas chefs, acompanhados de bebidas gratuitas. I was the only one in this class and enjoyed it very much. Chef Emanuel was very good. We booked this tour as a family of 5 - one 12 year old and 7 year old twins. We were told to meet at the tour office at 6:45. We then walked 15 minutes to the train station, only to get on a bus and be driven 30 minutes to the cooking facility (none of which was previously disclosed) The chef was patient, knowledge and kind, but the pizza was served until 10:00 PM. We were then dropped off at the train station and had to walk back to our apartment. There were also 14 people in this class which was way too many for one chef with no assistant to handle. I would suggest that this tour either be moved to an earlier time, or made adults only due to the late timeframe. The class should also be a 6:1 ratio. Great tour, but the description is rather inaccurate. Our tour started at 6:30pm and we didn't get back to the meeting point until almost 11:30pm due to our driver being 10 minutes late, then 20 minutes late, then finally an hour later he showed up claiming there was an accident - yet we saw none on our way back. He also drove exceptionally fast back to the original meeting point, possibly trying to make up time for being an hour late in picking us up. The restaurant that we had our class in wasn't even in Florence. At the meeting point we were met by our driver, who took us to the restaurant which was at Torciano, which was a 50 minute drive outside of Florence. No where in the description does it say you need to get into a van and have an hour long drive each way, turning this 3 hour tour into a 5 hour tour. When we arrived, we were asked to wash our hands, don an apron, then head to the kitchen to start cooking. We started first with the gelato, as this needed more time to 'cook' than the pizza. We were not given any flavor choices, we were told we were simply making vanilla. The chef measured out all of the ingredients then put it into the ice cream maker, and we just watched. Next we moved onto the pizza. The chef had already prepared 2 stations with the flour mixture, which was odd because I thought we were doing this ourselves? We weighed out all of the ingredients one at a time thankfully there was only 5 in our group or this would have taken forever, then started making our dough. The winemaker had given each of us a glass of proseco, then a glass of sparkling rose, and kept topping off our glasses as we cooked. The wine drinking aspect of this tour is highly understated. We all walked out of there bumbling drunks by the end of the night. This was actually more of a wine tasting/drinking tour than pizza/gelato making - not that that's a bad thing, but it should be mentioned. After we finished playing with the dough, the chef took ours away from us and gave us already prepared dough to use for our actual pizza's. So again, a bit confused here... were we just going through the motions of making and playing with dough and not going to ever use what we made ourselves? Next came the rolling of the dough. Chef failed to inform us that we should spread the roller with flour first, so half of us had sticky dough globs stuck on our roller and were struggling quite a bit. After stretching the dough, came the sauce. Create the perfect tomato sauce means popping the top off of a jar of canned sauce and spreading it on your dough. We didn't create anything with the sauce, it was from a jar. We were offered shredded cheese, sliced red onion, and sliced prosciutto as our topping choices, that's it. Chef put all of our pizzas into the oven and we sat down for a formal wine tasting with the winemaker while it cooked. There were 6 different wines in total to try, with generous pours in each one. As I said, we all walked away quite drunk when it was all said and done. The pizzas came out great, surprisingly, and the vanilla gelato was a fine touch afterwards. The wine stole the show though. As I said before, this was a wine tasting with a pretend cooking lesson in pizza preparation. It sounds like I'm complaining I guess I somewhat am, but we did enjoy the wine and bought 3 bottles to ship home - well 2 wines, and 1 bottle of olive oil. After all was said and done, the 5 of us sat there drinking and talking for over an hour while we waited for the driver to return and pick us up again. I was just very confused the whole night as the description of the tour did not match what our experience was at all. Did they bring us to the wrong tour? If someone didn't like wine, they would have been very disappointed in our group. Thankfully, we all did. We didn't do this tour so we can't review it. Something happened where we chose pizza and gelato at a farmhouse in Tuscany with a different tour company, but somehow ended up at a pizza restaurant in Florence. We wanted to go to see other parts of Tuscany, not spend the afternoon in a hot pizzeria. We spoke to the tour company who understood our disappointment and instead put us on a trip to a vineyard with dinner that night in Tuscany which was great. This cooking class was a disapointment due to the fact it was held at a reaturant and our chef/teacher kept running off to help customers the entire time. We were given plastic aprons and told to go stand in the kitchen where we waited for at least 25 minutes for the Chef to show up. We were told to pair up as we would be sharing a pizza between us. Then all the ingredents were given to us premixed. At one point when the Chef showed us how to roll out our dough, he used mine and my husbands shared dough to show the other students how to roll out there dough. We paid for 2 people, yet we had to share 1 pizza dough, then didnt even get to roll out our shared pizza dough. It was done for us. Then the preperation of the Gelato was the class watched as the chef prepared. We were put in a private room after the pizza was cooked so the class could eat and drink together. We were left in there for almost an hour. One of the other students had to go search out the chef to serve us our Gelato and give us our recipe book. Our family had a wonderful time! Our 9-year-old son said this was one of the highlights of his trip to Europe. Julio, the restaurant's owner, was very attentive to my son and wife, and we enjoyed eating our pizza and gelato after we made it. The restaurant is very convenient to the attractions in Florence its about halfway between the Duomo and the Gallerie Accademia, making it a great way to cap off a day of sightseeing. Highly recommended. This was a great way to have a meal and learn a little cooking. There were only six of us total, so it felt like an intimate evening among friends, even if you had just met minutes before. Nothing creates bonding like aprons and sticky dough. Our excellent Chef explained the process with great humor and allowed us to try and do what he had shown. He took the time to perfect our dough before sacrificing it to our amateur alterations of toppings. We learned a lot, laughed a lot, and had a great, hand made meal by the end. The pizza was almost too big to finish, and the gelato at the end just added extra sweetness to the evening. If you want to get your hands floury, and learn how to make pizza and gelato in just a few hours, this is the experience for you. We did it with a family of four, so it a thing for singles, couples and families. We were met promptly and taken a few metres to the restaurant. 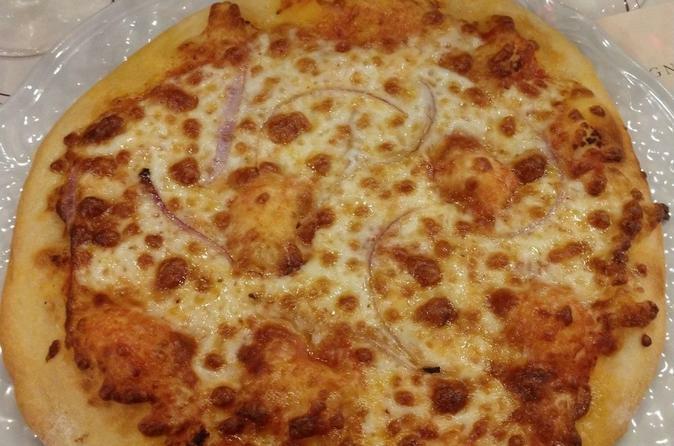 The chef was extremely knowledgeable and passionate about pizza making. The preparation area was very clean and there was a lot of attention to hygiene. We loved our pizza and gelato and had drinks to accompany them . It was a great experience but did involve a long time standing still which was a bit tiring. Unfortunately we have still not received the recipes that were promised would be sent by email. Very good value and good fun. I am excited to make my own homemade pizza and gelato! Pizza was very good and the gelato incredible--was a great way to start our trip to Florence.